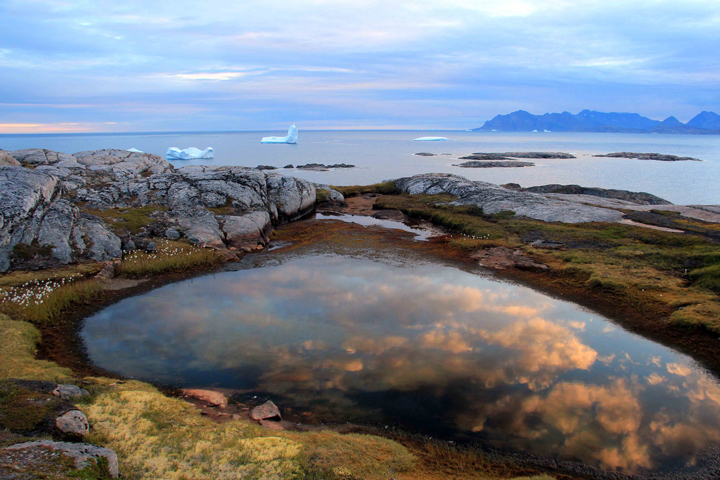 Nice cloud reflection on my last evening hike near the old harbor of Kulusuk. How fast is the water flowing in the firn aquifers? How permeable is the aquifer? How old is the aquifer? Is it growing inland from year to year? How much water is contained in it? 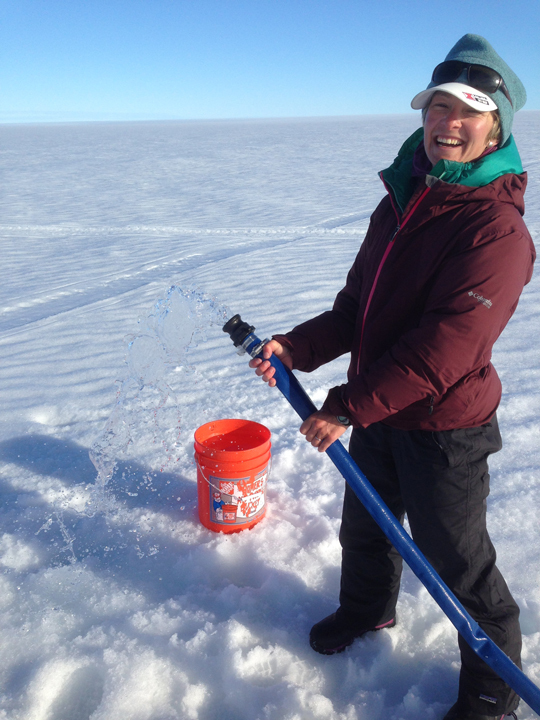 How fast the meltwater infiltrates from the surface to replenish the aquifer? What is the depth to the water table and how thick is the aquifer? To learn more on how we try to answer these questions, I invite you to read Olivia’s post where each method is described in more details. To wrap up, I am using bullet points and I am dividing them into themes: weather, camping, and science. Less than 5 knots wind on average. Windiest morning being the day when we moved our camp downstream to add a bit of challenge to set up tents. No significant snowfalls this year – only a few snow flakes! 2 bear-trip-wire false alarms at night, which scared us but only for a few seconds! Few dozen of hot water bottles being brought to our sleeping bag to keep us warm during the 20 nights camping. Long days typically 9 am to 7-8 pm. 12 seismic lines (forward and reverse lines) done with about 4000 hammer swings including 48 30-stack shots to get ourselves fit! 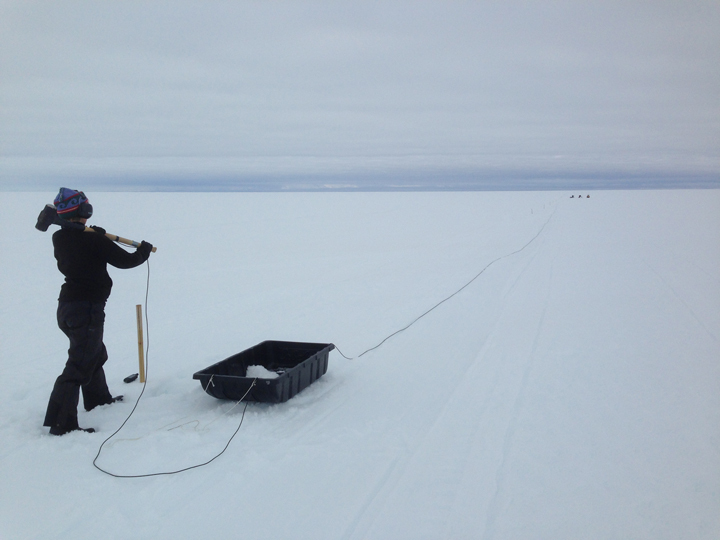 150 km of ground-penetrating radar data collected with a depth to the water table oscillating between 25 feet and 90 feet spatially. 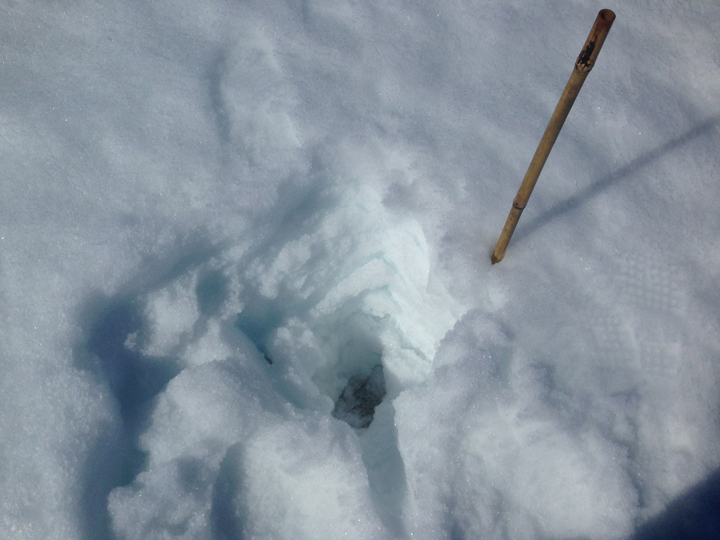 Two logging stations and one weather station dug out and raised up at the surface. One new logging station installed to measure water-table level changes, compaction rate and air temperature. 6 batteries recharged for powering our logging stations between Aug 2016 and Aug 2017 –- knock on wood! 18,000 liters (~280 showers) of water pumped out the aquifer during a 5-h pump test. At a rate of 1 liter per second! We did several pumping tests for a total of 90,000 liters. That is about it for our fieldwork summary, below, I have tried to summarize our work with photos in a chronological order. I hope you enjoyed reading the different blog posts and on the behalf of our team, I would like to thank you very much for following our journey in Southeast Greenland. Setup of our bear-proof camp. First, a trip wire which if tripped, triggers a loud alarm (sounds like a car alarm) and warn us about a possible encounter. The second layer of protection is a fence to shock the bear, and everyone had bear horns and bear spray. But we also carried a rifle in case the previous methods failed to scare the bear away. 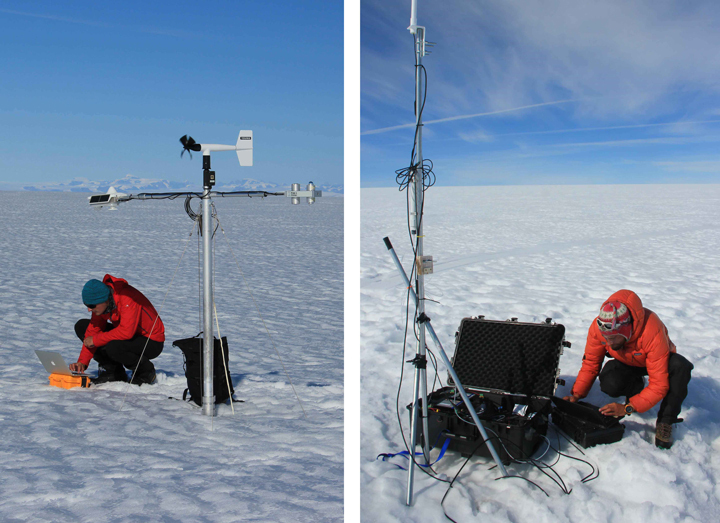 Downloading data from both the Utrecht weather station (left) and our other station logging 50 temperatures in the firn and water-table level changes (right). 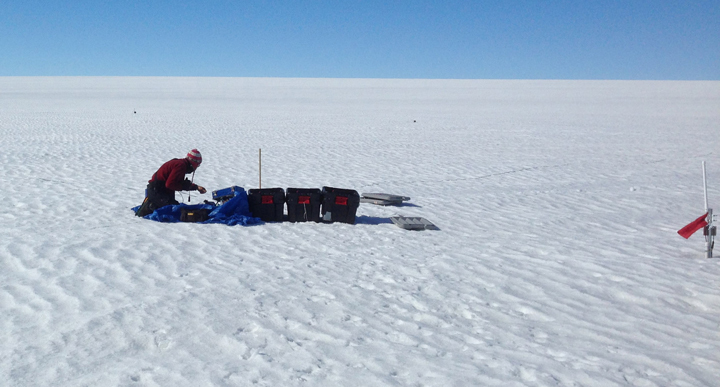 Drilling (left) and processing the firn and ice cores (right). 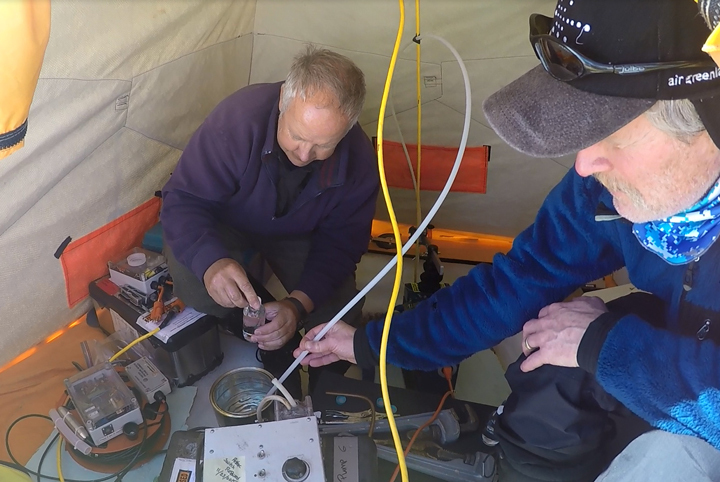 Kip and Rick sampling water from the firn aquifer. 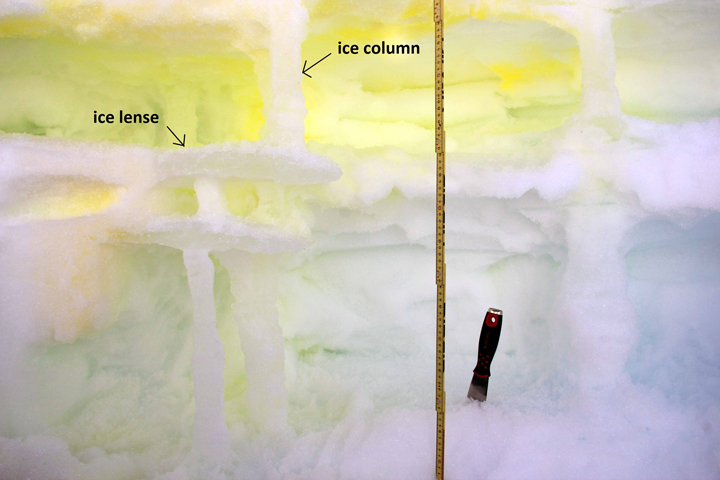 Excavating ice columns and ice lenses after spraying neon-green dye at the surface to look at water infiltration processes. Working after dinner on a small-scale seismic survey in nice the evening light. Getting the MRS measurement started after setting up the 80 by 80 m loop. 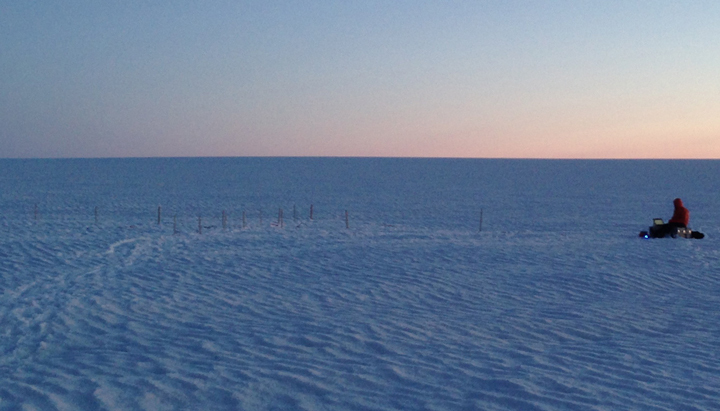 On the right, one of our logging station after one year of data collection, only the top of the mast (ARGOS antenna) is above the snow surface. Aloha! After 20 days of work, the helicopter is coming back to get us, we greet with Hawaiian style! 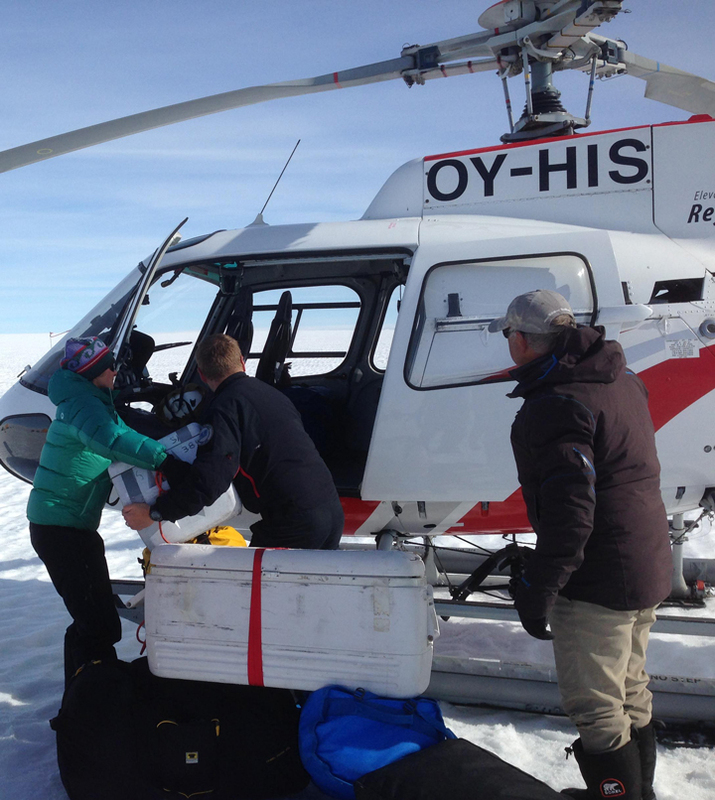 Olivia hands our precious water samples to Johannes for loading them in the helicopter as our first priority. Nick (orange helmet) has the last sling load ready to go and is getting prepared to hook it on to the cable attached to the helicopter. 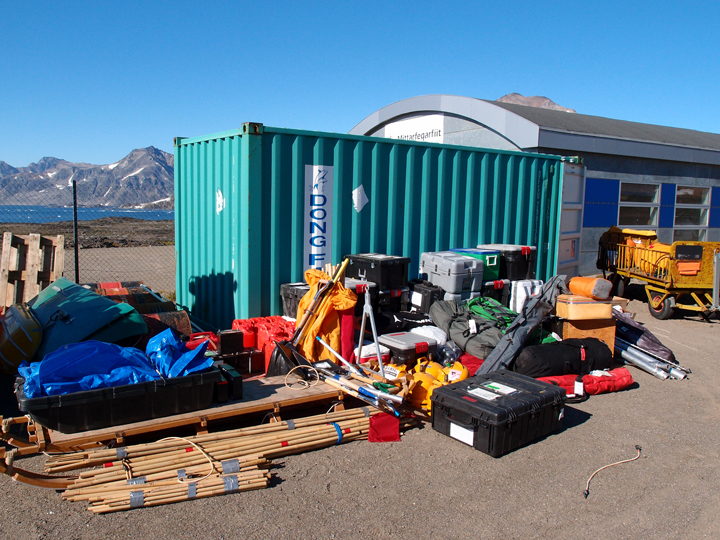 Back in Kulusuk, we spent a few days packing up the equipment. 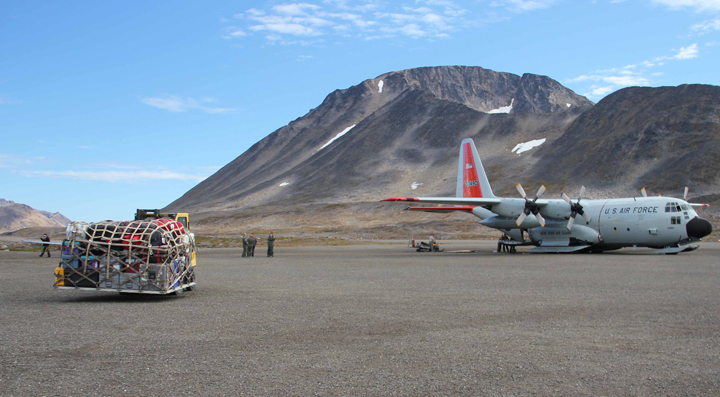 On the last day a LC-130 came from Kangerlussuaq to pick up a few thousand pounds of equipment. 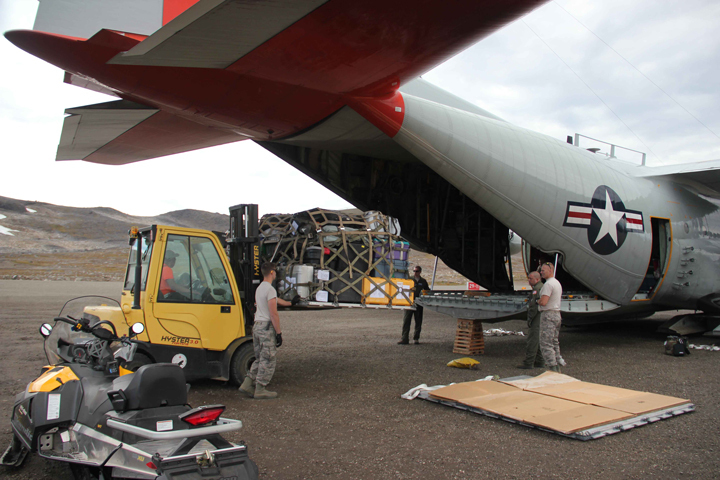 You can barely see the small forklift from the airport moving the Air-Force pallet at the back of the plane. 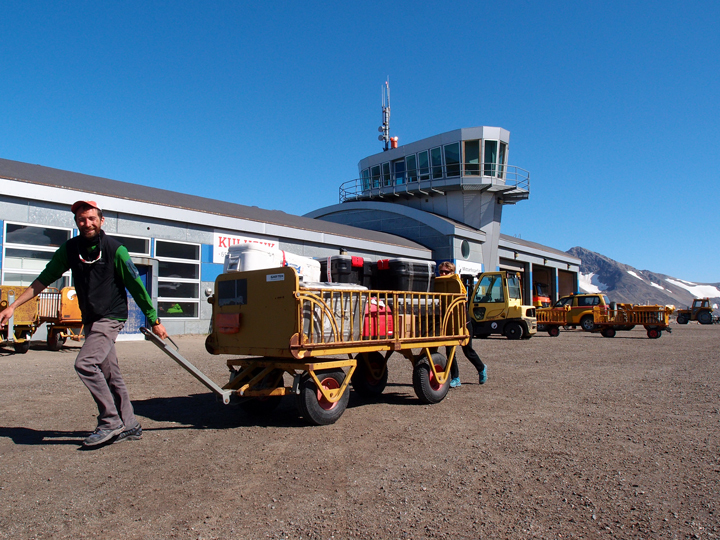 Loading up the science equipment into the plane. 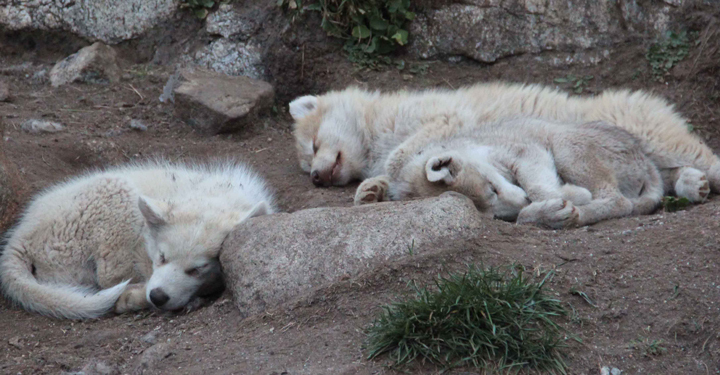 Peaceful and sleepy husky puppies in the evening. 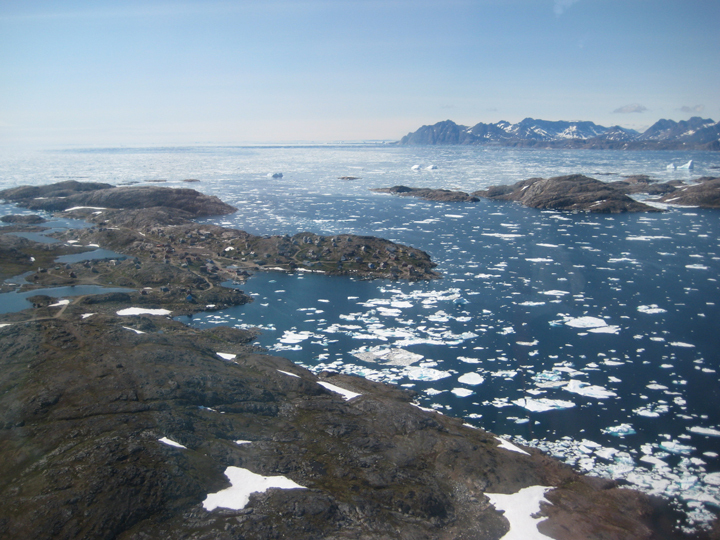 View of the Kulusuk Island from the air. At the left you can see the airport runway and on the right, you might be able to spot the DYE-4 station. 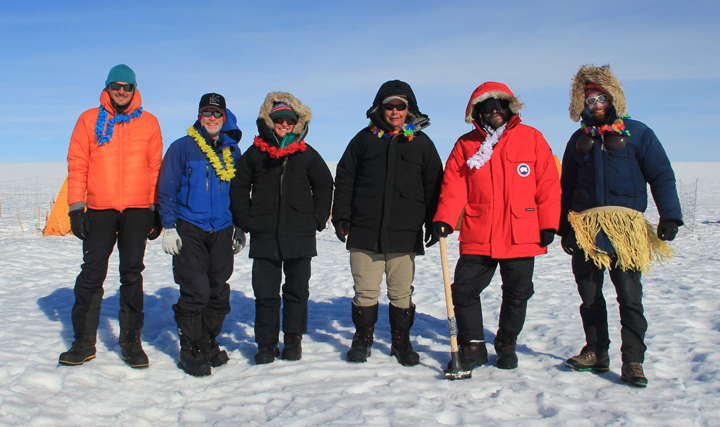 Last Saturday, part of the team arrived safely in Kulusuk! 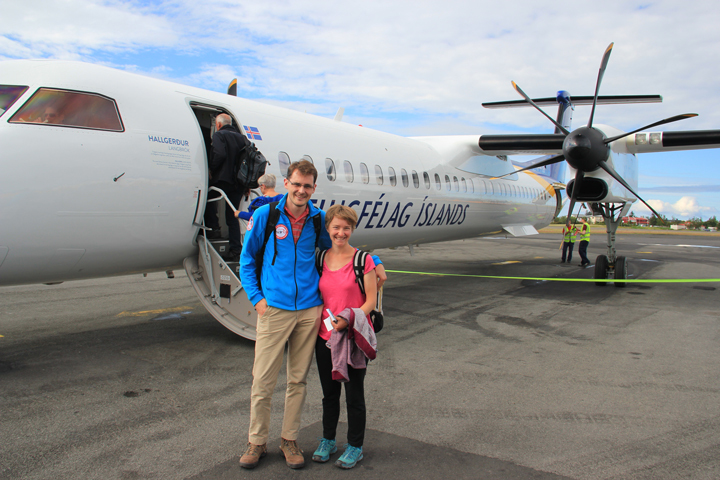 Olivia, Clem and Stefan flew in two hours with Air Iceland from Reykjavik (Iceland) to Kulusuk (East Greenland). 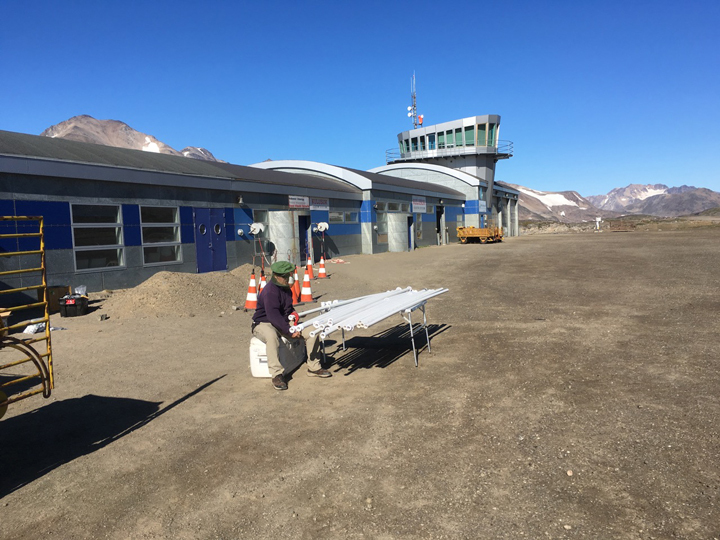 This is one of a few international airports on the east side of Greenland and also the home of our container full of camping and science equipment. For me, this is my first time in Greenland and I am glad I can share these first impressions with you. Olivia and I about to board the plane to Kulusuk. 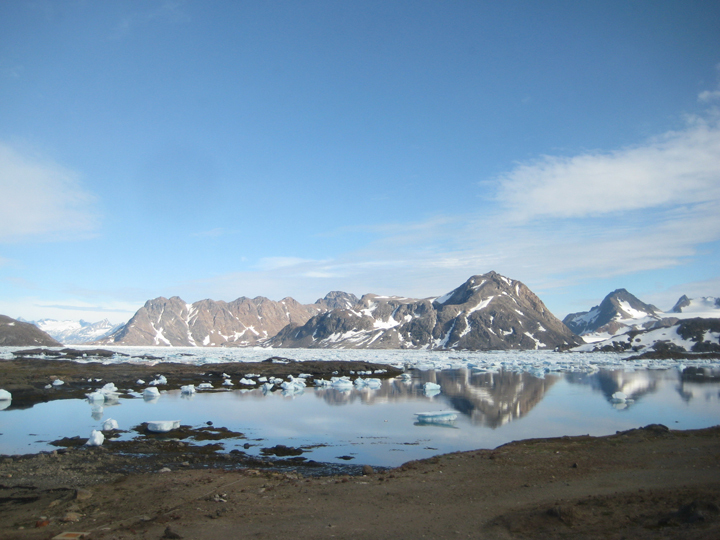 The current weather in Kulusuk is absolutely splendid: blue skies, light wind and around 5 C (about 40 F). This also provided us with very nice views from the plane. One hour into the flight, the dark mountains of the Greenlandic coast appeared, covered in snowy patches or more permanent glaciers. Behind them, in the distance, the vast white ice sheet was visible. As we flew closer, the icebergs drifting in the ocean also become more and more impressive. 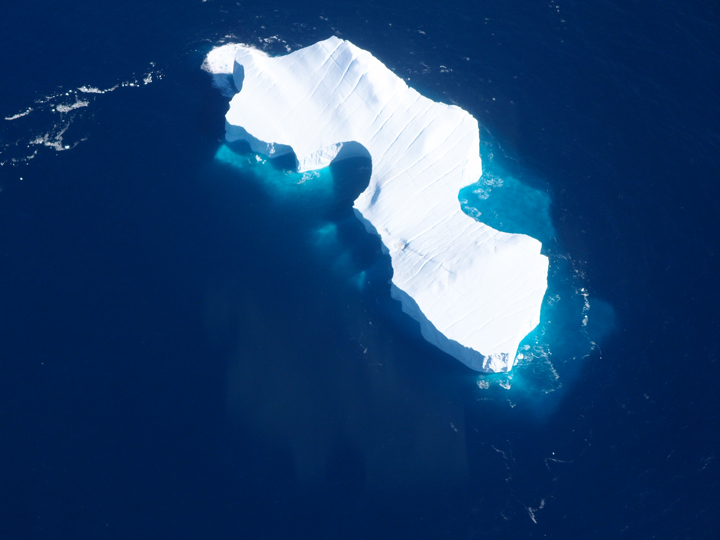 Glaciers that terminate in the ocean sometimes lose large portions of their floating part as icebergs, which can ‘survive’ for quite some time in the ocean. The white ice in contrast with the light blue water surrounding is really stunning. After 15 minutes of watching in awe and snapping photo after photo, we landed on the dirt runway of the Kulusuk airport. 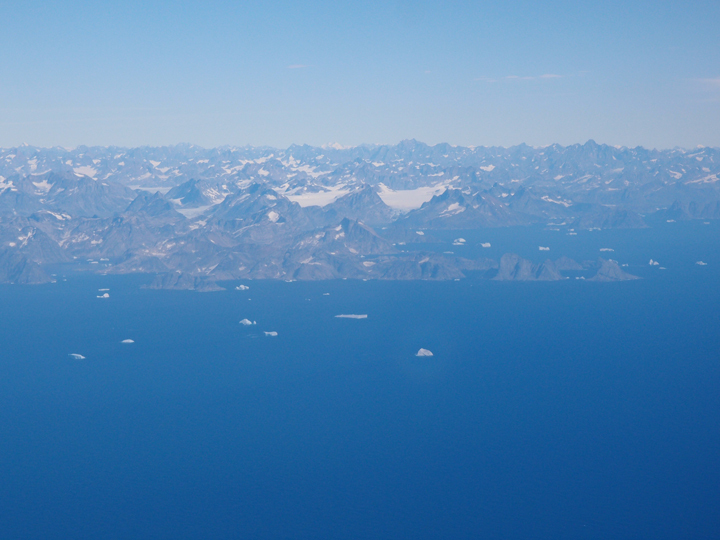 First view of the coast of East Greenland. The ocean is filled with enormous icebergs. Fantastic view of a huge iceberg; the walls are likely 10-20 meters high. Also note the nice crevasses (the diagonal lines) on the surface. We brought our bags to Hotel Kulusuk, which is actually the only hotel in the village of Kulusuk, and decided to use the rest of the day to check on all our equipment. Most of the tents, sleeping bags, and science equipment is stored in a large container at the airport. We walked to the airport (about 20 min) and on our way there, we heard a loud noise and saw part of a gigantic iceberg collapse, very impressive. At the airport, we luckily found all 33 boxes we shipped this spring nicely stacked in a corner of the building. With that, the big inventory could start! 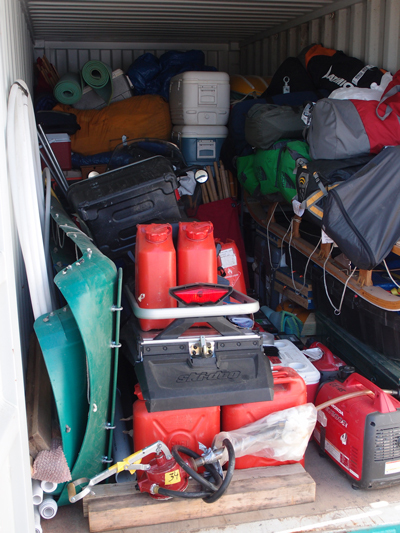 We unloaded the container and organized everything in different categories: camping, science, snow mobile, and not-needed-this-year. We made great progress, but need a couple more days to organize everything and put it in boxes (about 70 in total!). In the end the limiting factor is the weight that can be carried by the helicopter. The schedule for the coming days is that Rick and Kip arrive Sunday, Nick on Monday, and on Wednesday and Thursday we get transferred to the field site. At least, that’s the plan. Clem and Olivia using airport baggage carts to move our boxes filled with equipment. All our stuff in the container. All our stuff out of the container. Our dinners for the next three weeks. Finally, a little bit about myself. I am Stefan Ligtenberg and a post-doc at Utrecht University in The Nethelands. During my current 3-year project, I aim to simulate 3D water flow in the firn aquifer using a computer model (vertical percolation of surface meltwater through the snow to recharge the aquifer and lateral flow downslope within the aquifer). To do so, I use a snow model in combination with an adapted groundwater flow model. One of the important constraints for these models is the so-called hydraulic conductivity; how fast can the water move through the porous snow. 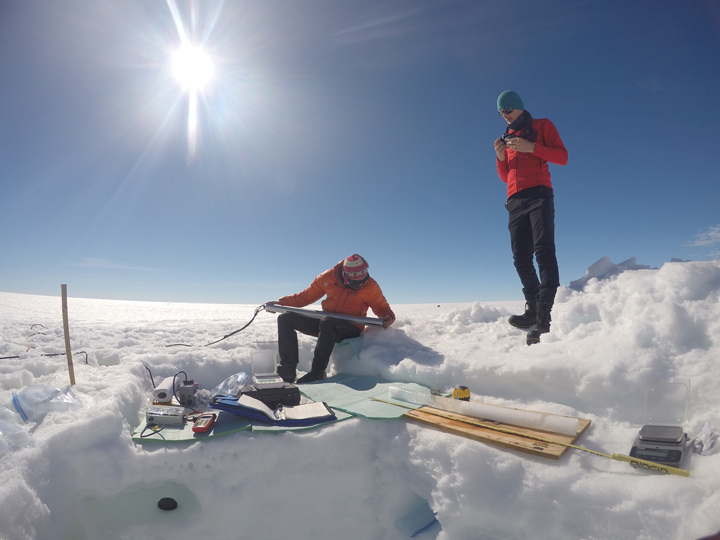 One of the main goals of this years field work is to better measure this conductivity. We are ready for the big day! Tomorrow (Wednesday) we will start our put-in to the field. With a total of 5 helicopter flights all our gear, science equipment and the entire team will be flown to our field site, approx. 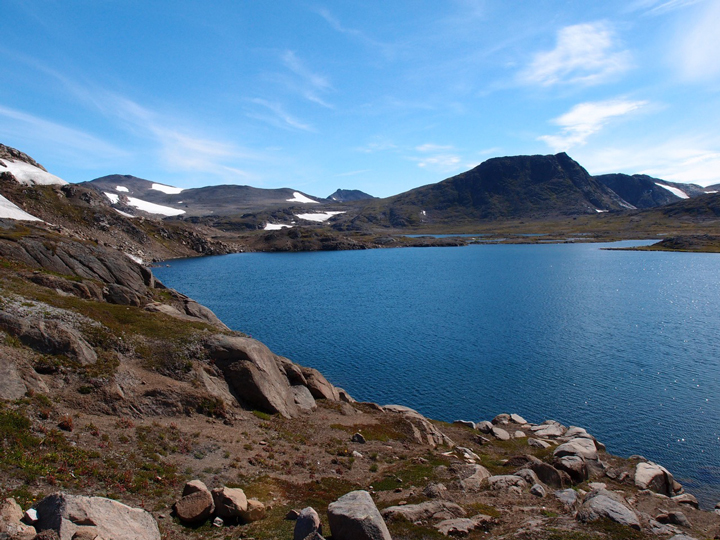 130 km northwest of Kulusuk. 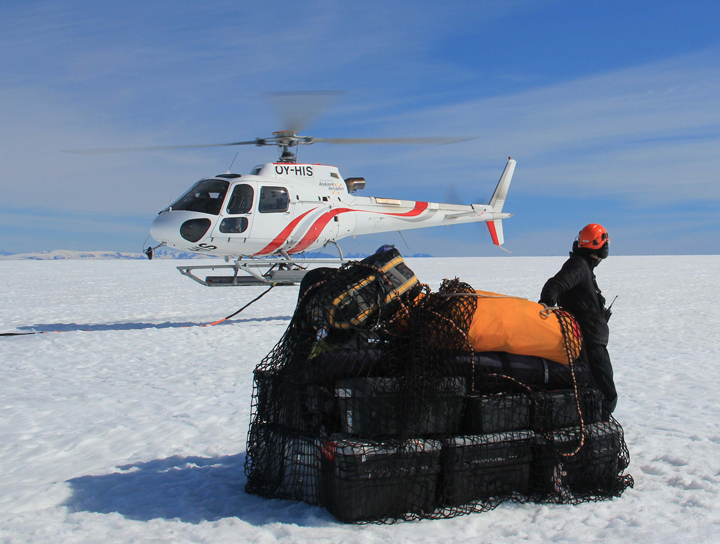 However, we have to take the weather in account; if it is foggy on the ice sheet the helicopter will not be able to land and the put-in will be postponed. So, fingers crossed! View from the village of Kulusuk. Great weather! During the past three days, the team arrived according to plan: Rick and Kip on Sunday morning and, last but not least, Nick on Monday morning. 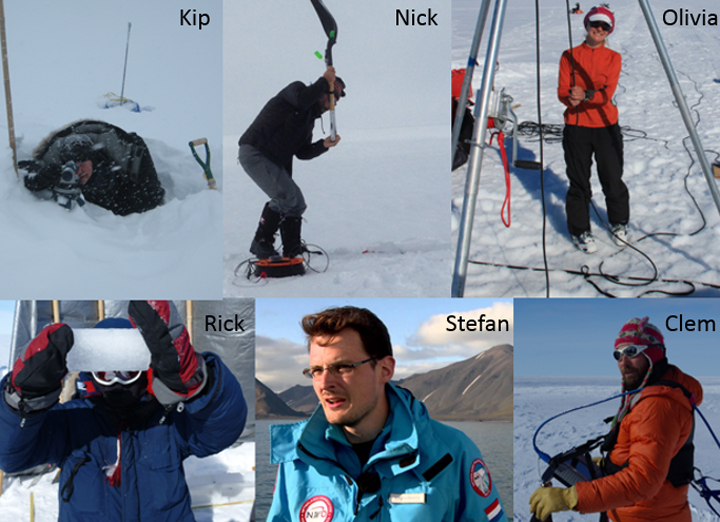 Having the entire team in Kulusuk made the organization of the equipment rather quick and smooth. To give you an idea of the preparations we have done: we checked and strengthened about 100 bamboo stakes, repaired tears in the tents, tested the generators, checked the gasoline on contamination with water, charged ~20 batteries, and every group sorted and tested their own science equipment. 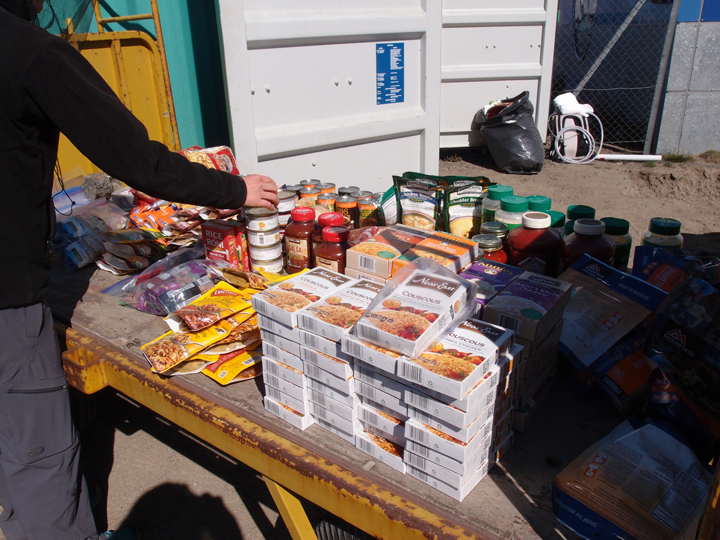 In the end, we had 132 packed and weighted items ready to be taken to the field. 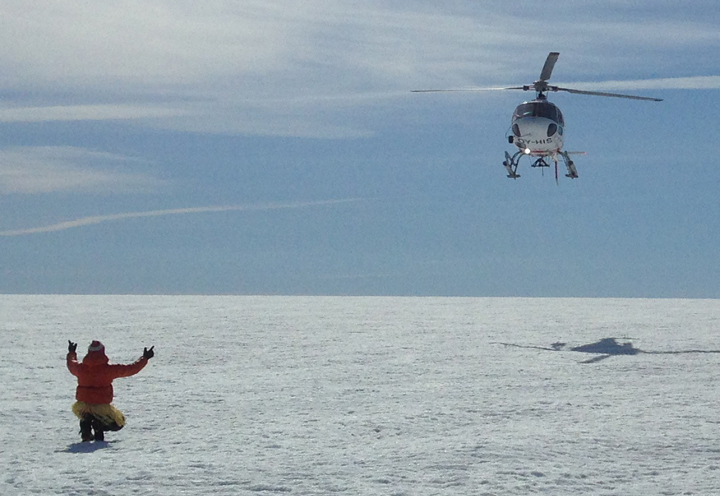 This afternoon the BlueWest helicopter arrived from Reykjavik with our two pilots Johannes and Nicola. They crossed the ocean from Iceland to Greenland on the narrowest part as that is about the maximum distance the helo can fly. From there they followed the Greenland coast southward till Kulusuk. On the way, they saw seals and a group of 10 whales from the helicopter. That must have been an awesome sight! Kip replacing the coupling on the borehole liners. 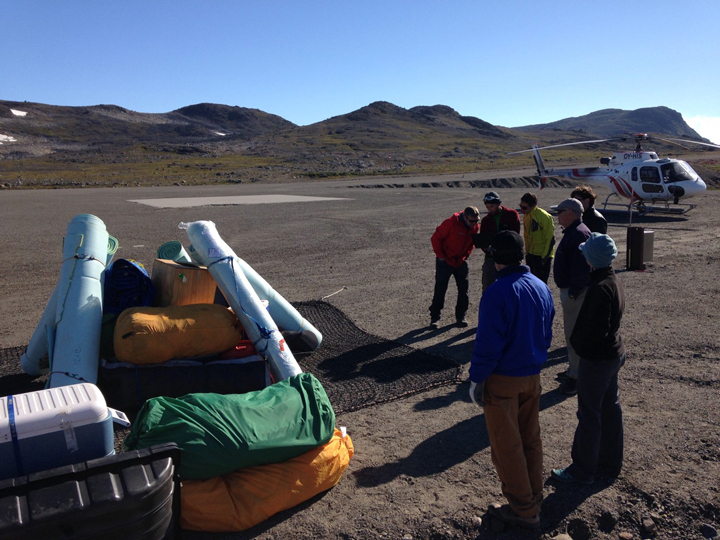 Packing the first sling load with the BlueWest helicopter on the right. Today, we also had time to test and practice our drone-flying skills! This year, we brought a drone with us for both a serious and less serious goal. 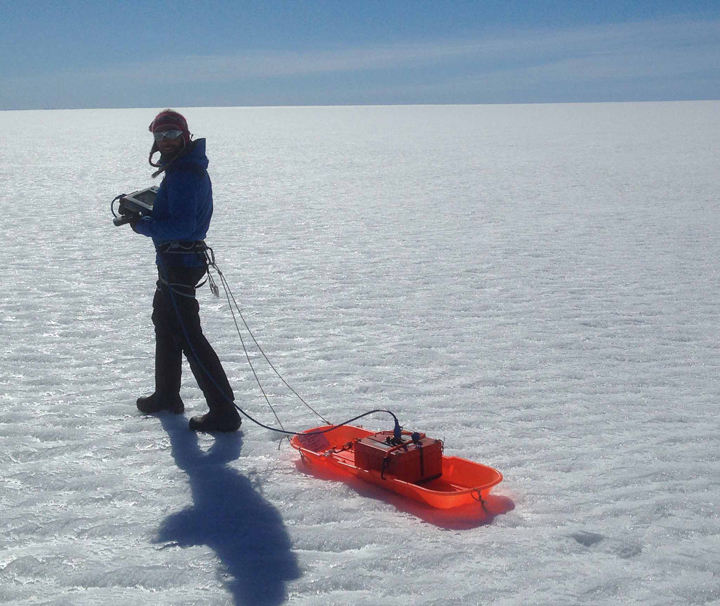 First the serious one, we will use it to scan the lowest section of our study area for crevasses. These cracks in the ice are very dangerous as they can be very deep, so it is not advisable to go close to them! 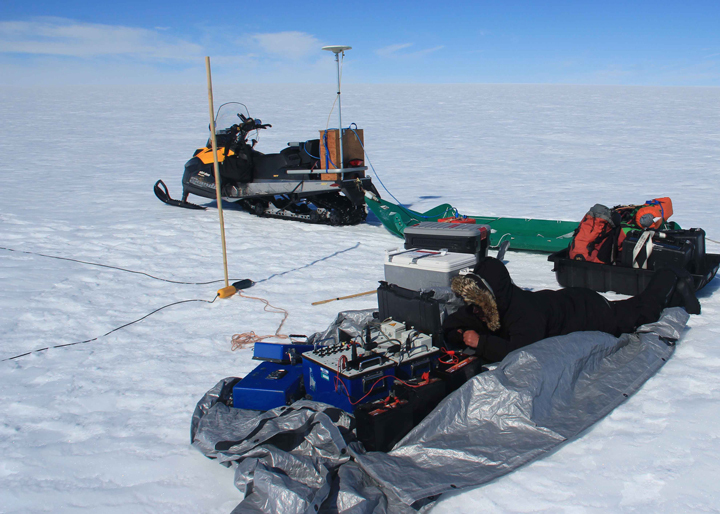 However, as the ice sheet is very flat you sometimes cannot see them until you are dangerously close. With the drone we hope to spot them earlier and keep a safe distance. Next to this, the drone will be able to make a number of priceless pictures and videos of us doing science. 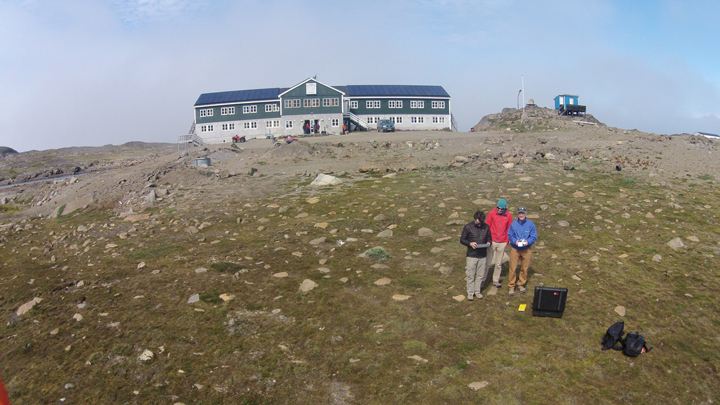 Photo from the drone: Nick, Stefan, and Rick in front of Hotel Kulusuk. Now it is time to finish packing, take a last shower and go to sleep. Tomorrow, there are three flights scheduled: first our camping equipment will be flown in by sling, followed by a part of the team who will set up camp. The science equipment will be flown in next. The next day, the snow mobile and fuel are brought in followed by the last passenger flight. At least that is the plan, the weather can still change everything…! Greetings from Kulusuk! Olivia, Nick, Clem, Rick, Kip, and Stefan.